The river fly fishing season begins in October and finishes at the end of April, thus the season starts in spring, moves to summer and ends in autumn. The variation in seasons and trout diet means that there are three distinct seasons within the fishing year. Early season fishing in New Zealand has some advantages and disadvantages. On the plus side, the fish have not seen an angler for five months. Due to snow melt and rain, the rivers are running high making crossing the larger ones challenging (or downright out of the question)! At this time of the year the weather is changeable, make sure you bring your dull-coloured rain coat. It is early in the season that trout seem to love big nymphs - the stone fly is a classic early season fly. Typically 75% of your catch will be using a nymph under an indicator. 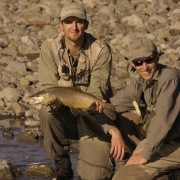 This is the time for classic dry fly fishing at its best. The rivers have dropped a little, the weather is warmer and more stable, insect life has increased. Mid-season should see you catch 80% of your fish using a dry fly. The parachute adams is the classic NZ dry. This time of year will also see terrestrials like cicadas making guest appearances on the water. Stubborn fish may need to be encouraged with a small tungsten nymph under a dry or indicator. With all this dry fly action, it will come as no surprise to you that the fishing pressure increases. Dry fly, terrestrials and small nymph time! There is a good chance of mayfly activity on some waters. The weather is less stable than mid-season, though river heights should still be comfortable. It is starting to cool, however truly icy weather is a rarity. The changing weather conditions means you need to adapt to the conditions of the day. The good news is that most of the overseas anglers have departed, so the angling pressure is lessened.